Nowadays we tend to regard the repentir as the record of a highly individual process, by which the artist revises and improves as he searches for the perfect form, as if regretting his earlier solution. The terms repentir and pentimento are in fact derived from words meaning “repentance”, and in Germany they even spoke of the Reuezug or “stroke of repentance”. There are at least a few pentimenti in any painter’s oeuvre. Titian, though, made countless modifications to his work, and evidently did so without feeling the slightest bit contrite, for traces of the rejected passages are often still visible, and in many cases must have been so in his own day as well. I’ve long appreciated that “repentance” simply means, quite literally, a re-think, rather than the guilt-fuelled self-pummelling my evangelical upbringing once made of it, but the idea of the artist’s pentimento or correction as an image of the practice of repentance hadn’t occurred to me. The altering mark is not, in my experience, a matter of self-rebuke, but one approximation of many – another movement a little closer, at least for now, towards the reality of the image. The charcoal adjusts itself towards the conception for which it strives. What is abandoned in the alteration may be left visible, not as bravado, not merely as a sign of confidence but as an act of confession; the nail wounds are still present on the truly shameless hands of the resurrected and perfected Christ. 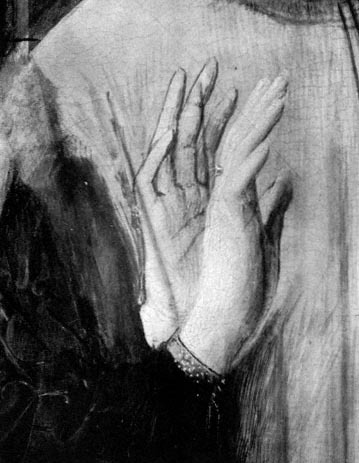 “Confession” in its original sense means acknowledgement, while stigmata are merely “marks”. 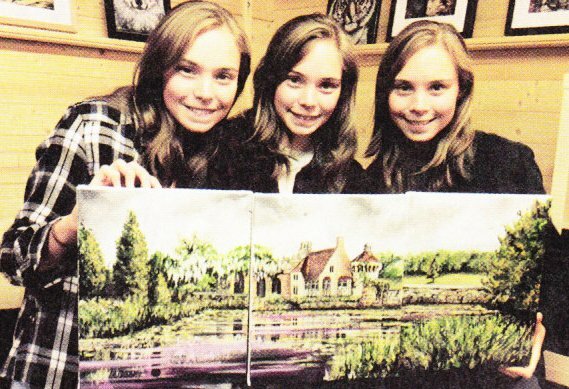 We painted on one canvas together and did it three times as fast as we would have individually because we could swap when one of us got tired … Rachel is really good at plants and foliage, Sarah is best at skies and Rebekah prefers architecture. So we work out what we each want to do before we start and come up with a plan that plays to our strengths and combines our styles. It can be annoying if someone changes something that one of us has worked on in a certain way, but we always work through it. How excellent! Without wishing to deny the individualities of the girls in any way, it’s hard to conceive of a better icon of the creating Trinity, or a better illustration of a process of collective or communitarian repentance, as each member of the godhead, while maintaining her specialism, thoughtfully modifies the strokes of another as they “work through it”.